Christmas is a time of celebration and what would a party be without the cake? Or today, we're making Christmas cupcakes. Boy stuffed the tin with green cupcake wrappers and we filled them with confetti cake mix. I'm not a big fan of the red icing. 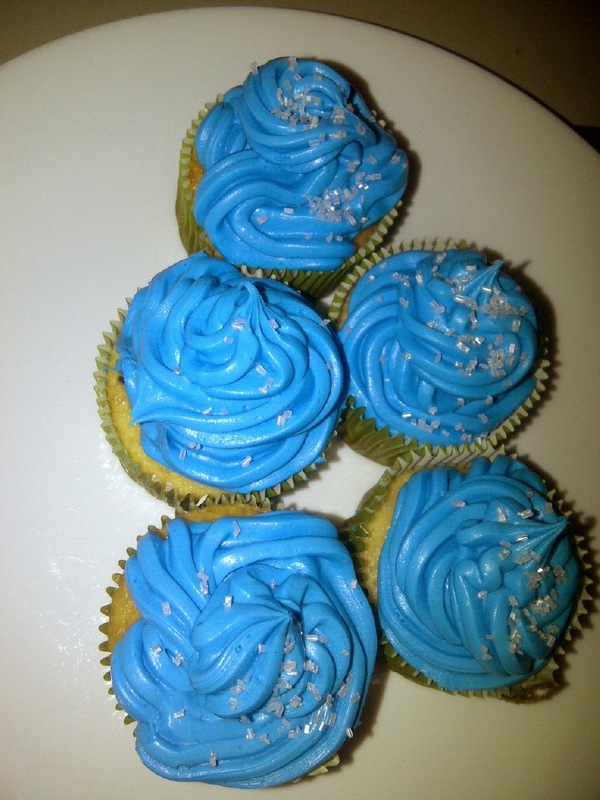 It stains little faces and clothes, so we decided to go with blue and clear sprinkles for a winter wonderland kind of feel. Plus, Boy got to mark off two more achievements in his Bear book for cub scouts. He prepared a dessert for his family and baked for his pack meeting. Tonight, we're off to visit the residents of one of the nearby elder care facilities to share some festive cheer, sing carols, and have snacks. It is both a fun time and a sad time for the boys this Christmas. I'll share more in the weeks to come, but for now we will remain cheery and celebrate the season of Christ's birth. Are you listening to carols while you prepare? A friend of mine is blogging today about her favorite Christmas music, you may want to stop in and check out if you have any favorites in common.